Assembling what is arguably the ultimate Porter Cable polishing kit was no easy feat. First, we had to develop the products. Wolfgang Uber Compound has been years in the making and I’m excited to finally see this amazing compound available a la carte and with this complete polishing kit. Once we had the compound squared away, the rest of the crew and I spent some time gathering input from customers on what they look for in a kit to remove swirls, scratches, water spots and other gloss-hindering imperfections from their vehicles. Long story short, we ended up with what you see here – the Wolfgang Porter Cable 7424xp Ultimate Polishing Kit. What makes this the ultimate polishing kit? For starters, it contains the best German polishing compound money can buy – Wolfgang Uber Compound. Second, it contains world-renowned Wolfgang Finishing Glaze, an assortment of Lake Country 5.5 inch Hydro-Tech pads and a host of essential accessories including Wolfgang Pad Werks pad care products, a nifty Foam Pad Conditioning Brush, and – since I was feeling generous the day I designed this kit – a couple microfiber towels on me. 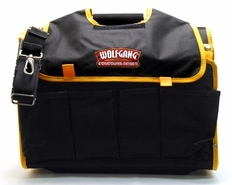 There you have it – the Wolfgang Porter Cable 7424xp Ultimate Polishing Kit. Wolfgang Uber Compound is a heavy-cut compound that is designed to restore the gloss and color to all paint systems without creating unsightly swirls or compounding haze. Formulated using an advanced blend of micro and diminishing abrasives, Wolfgang Uber Compound effortlessly removes heavy swirl marks, oxidation, water spots, and etchings from bird droppings without dulling the finish or creating new swirl marks. The blue foam is designed for compounding and swirl removal. This closed cell pre-polymer foam restores oxidized and heavily swirled paint. Looks can be deceiving; the blue pad looks coarse but actually finishes with no marring. You'll achieve an almost wax-ready finish in one step. That's another way the Lake Country Hydro-Tech 5.5 Inch Foam Pads save you time. 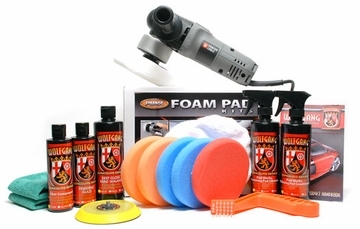 The crimson foam is designed to apply waxes, glazes, and sealants in flawless, even coats without causing swirls. The soft foam has very light polishing ability, making it a great choice for cleaner waxes, too. Since the crimson pad is made of Hydro-Tech foam, it does not soak up liquid waxes and paint sealants like some finishing pads can. You'll be able to cover more paint with less product. Each bonnet is made of the softest blend of microfiber available! Strong, durable polyester makes up 70 percent while soft, silky polyamide makes up the other 30 percent. Incredibly small fibers are woven together in a split weave that softer, thicker, and plusher than flat weave microfibers. These bonnets fit comfortably over any of the included 5 1/2 inch Hydro-Tech foam pads. Cleaning your pads removes all kinds of chemicals that have been embedded into them during the buffing process. This can include all types of solvents, carrying agents, abrasives, petroleum distillates, silicones, chemical cleaners and other nasty substances. Removing the liquids and the solids that build up both on and inside of your buffing pads preserves their integrity. A total retail value of $372.84. 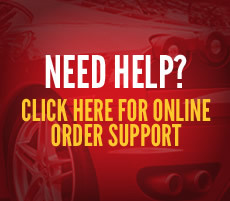 You save $72.85!